France - Thousands of youths, and others angry with the French government, took to the streets following Sunday night following the final presidential election results that showed a victory for right-wing candidate Nicolas Sarkozy. 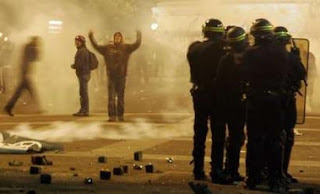 Riots erupted in urban centers throughout the country including the capital of Paris where some of the most intense clashes were reported in the Place de la Bastille. More than 700 cars were torched and government buildings and property came under attack. Police clashed with protesters who were described by French television as "militant anarchists." During the fighting dozens of officers were injured and hundreds were arrested. Some expect that the unrest which has continued unabated for two nights to be only a prelude to disturbances that may paralyze the country if Sarkozy attempts to make good on some of his campaign promises which include numerous reforms some of which would limit the rights of workers and their unions.